Everybody has heard of the protozoa: Paramecium for example is a very common example, and offers a classical subject for observation. Protozoa are one type of critter which are easy to cultivate at home by soaking plant fragments in a jar of water. In three or four days the water becomes cloudy and somewhat bad smelling because bacteria are growing; the protozoa which eat them, become numerous. This process can also occur if you forget to regularly replace the water in a flower vase! An old trick if you want to cultivate protozoans is to place some individuals of the species of interest into a water container. Let the water stand beforehand to allow traces of chorine to disappear and add ONE rice grain. Rice provides food for the bacteria, and protozoans eat the bacteria. Ciliated protozoans are probably the best known but other amazing families exist. Ciliated protozoans are very numerous: more than 7000 species and their identification is not easy! Protozoans, (their name means: 'first animals', which is not quite exact, because they aren't related to the animal kingdom), are unicellular but this single cell has sophisticated functions: motion, feeding, reproduction by cell division. 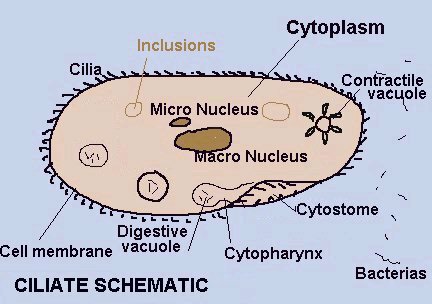 The ciliates (see schematic) often have two nucleii (or more ...) the larger one (macro-nucleus) is asociated with nutrition and the smaller (micro-nucleus) with reproduction. Contractile vacuoles are used to maintain osmotic balance (ion concentration) of the cell by water evacuation. Some species build a sort of home called lorica, in which individuals can take refuge. 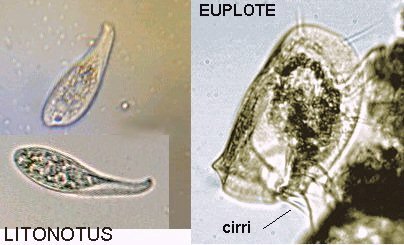 Sometimes, ciliates are classified into four groups: Prostomata (Litonotus, Coleps..) - free swimming ciliates, Karyorelicta - only marine; Polyhymenophora with large cilia - (Stentor, Spirostomum, Euplotes, tintinids..); Hypostomata including suctoria, Paramecium, peritricha e.g. Vorticella. Protozoa can be found in ponds, pools, or in any place where water is rather stagnant. But it's sometime difficult to believe that they also live in the sea, with species quite similar to those in freshwater but perfectly adapted to a marine environment. Are these marine forms really the same species, which progressively, with natural selection, have adapted themselves to this 'hostile' environment? We can imagine individuals living near the rivers, have been carried away into areas of increasing salt concentration, streams estuaries ..., and some of them, genetically more resistant, have survived and reproduced there. Or may be the reverse process is true: protozoans came from the sea and then colonized rivers? But nowadays, salt water species cannot to survive if they are placed into fresh water. Here is a gallery of some MARINE species (some of them can resist a high salt concentration). To remain manageable, just free swimming and attached species are presented. Most of these protozoans are not caught with a net but found among algae or bryozoan loricas. Some of the free swimming forms eat algae and you can see a green color inside the cytoplasm (image left below); others eat smaller protozoans like the species with a large cystostome and six vacuoles, shown in the righthand picture below. In real life the first vacuole near the 'mouth' contained a living protozoan which was still moving ! Litonotus is easily recognisable by the sort of snout it has, (x15 - right). Flagellated cells (below) (probably Entosiphon): note the two flagella (x40). Euplotes, above, have cilia gathered together to form thick structures called cirri, which are sort of legs, and you can see them 'walking' on plants. Their protoplasm is not flexible. They are HYPOTRICHS, because their cirri are only on the ventral side. One very elegant family are the Tintinnids which look like a French champagne glass. They are mainly marine organisms. Individuals can retract into its lorica if disturbed. When it comes out, the crown of cilia is used both for locomotion and to catch food. The three same specimens are probably from the genus Favella. 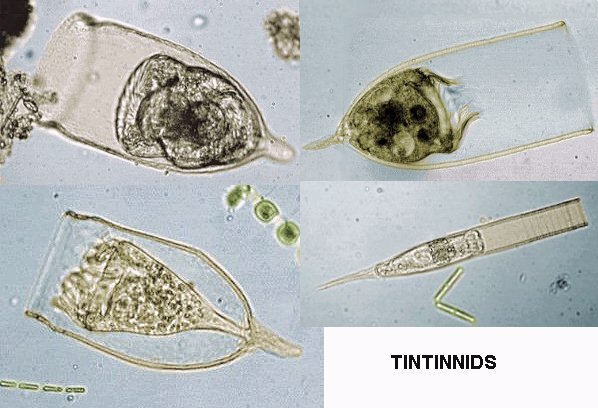 Tintinnids are numerous in seawater only during the summer months. 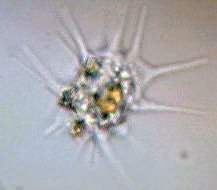 A 'sun animacule' Heliozoa with radiating pseudopods called axopodia, which effectively make it look like a sun. Probably Actinosphaerium genus. A closer view of the protoplasm is shown far right (x15). Unlike in fresh water, shelled amoeba which build rigid 'houses' with organic debris, are not present in marine samples. But these samples are rarely taken from the sea bottom and perhaps shelled forms are living amongst suitable detritus for their 'home building'. Published in the March 2001 edition of Micscape Magazine.